Make self promotion piece from personal interests. Loosely structured interviews, making personas out of research notes, workshop to generate solutions. Research feasibility of best workshop idea. Scoped out idea through doing Event Trees (Task Analysis method). Entered design cycles of wireframe, prototype, usability test and evaluate. Free gym app that makes going to the gym exciting for users. Responsible for all aspects of the design, research and programming. Workshop participants where graphic designers holding senior or management positions at their work places. 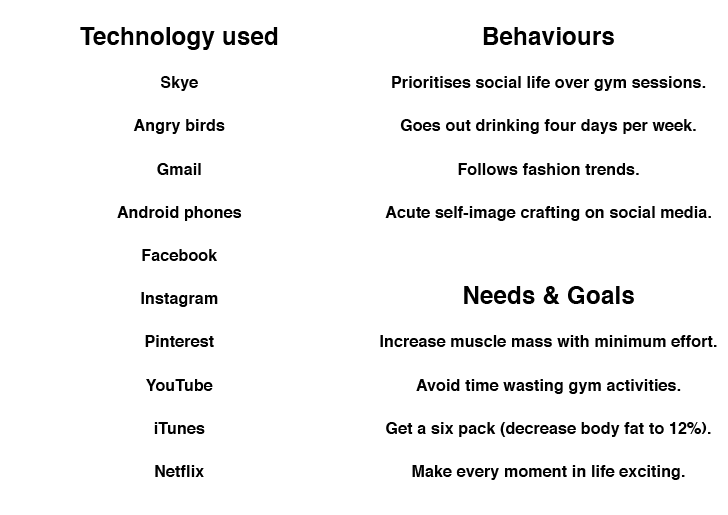 Loosely structured interviews after work in various London pubs over a six month period to find out why people stop going to the gym, took notes in my smart phone. Results from over 30 interviews showed people mostly stopped going to a gym due to unfortunate circumstances (e.g. membership was too expensive). Identified one group which we could help (people who stopped going because they found the gym boring). Turned interview notes into three personas with a running theme of why said persona finds the gym boring. Recruited workshop participants by inviting Graphic design friends interested in getting into UX to a dinner party, our after dinner games took the form of makeshift workshops to: 1, Think like the personas; 2, Generate solutions to make going to gym exciting for personas; and 3, Used 'forced ranking' to pick the best solution. Highest ranked solution involved creating random gym routines to defeat boredom. To improve personal fitness for a charity event I trained in the gym three times per week for five months. 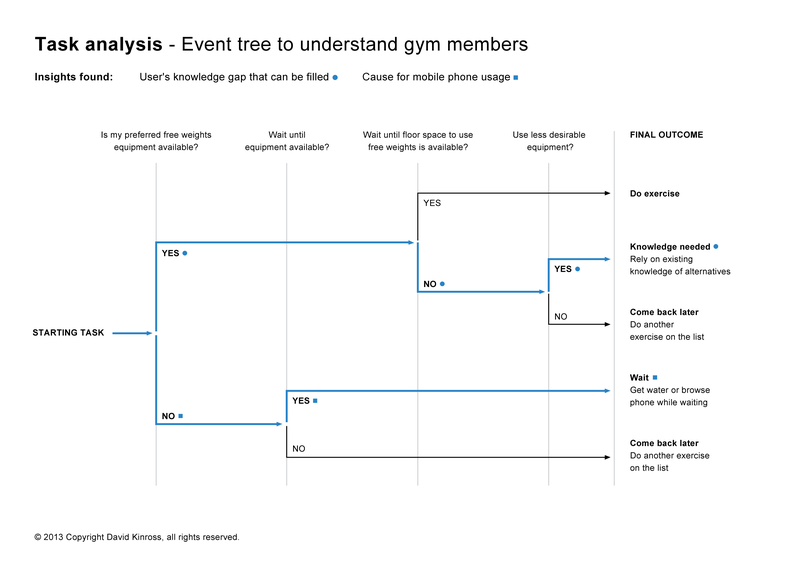 In between sets of repetitions and after the whole workout I preformed an informal task analysis to understand how others formalise their gym routines. This analysis produced Event Trees that identified that people centre their routines around improving a non negotiable list of muscles. People encountered force brakes when equipment needed to improve their chosen muscle was unavailable. Force brake activities involved people looking at their phones. This lead to the 'eureka' moment: make a phone app which randomly finds you a new exercise for the muscle you want to work on. 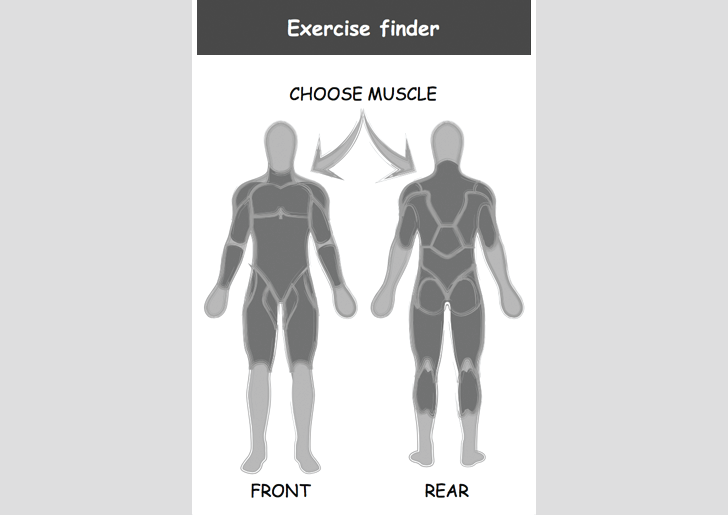 Did wireframe designs for finding a random exercise for users' selected muscle. Turned wireframes into a clickable medium fidelity prototype. Did usability testing in the pub with prototype, evaluated results and fed research back into UI design. Repeated design, test and evaluate cycle two more times. Increased the prototype's fidelity level in each cycle. Last cycle was with a rapid prototype built with real content which I got from doing a skills swap (for my part of the swap I wrote some automation scripts). With a working app I did usability testing in the wild (in the gym). High fidelity for usability testing at the gym. © 2015 Copyright David Kinross.